The Holy of Holies refers of course to the innermost chamber of the Temple in Jerusalem – and before that in the tent that went through the desert with the Israelites. Blake reminded us that God is present in a grain of sand; here is Chesterton meeting him on a Spring morning. These cowslips are growing in pastureland, where sheep will safely graze later in the year. We were told that the farmer seeded the field with wild flowers. Thank you to him! This entry was posted in poetry, spring, Uncategorized and tagged creation, environment, farming, flowers, GK Chesterton, poetry, science, sheep, spring on May 8, 2017 by willturnstone. Mrs Turnstone’s friends had gathered in Wensleydale so we accepted their invitation to join them. 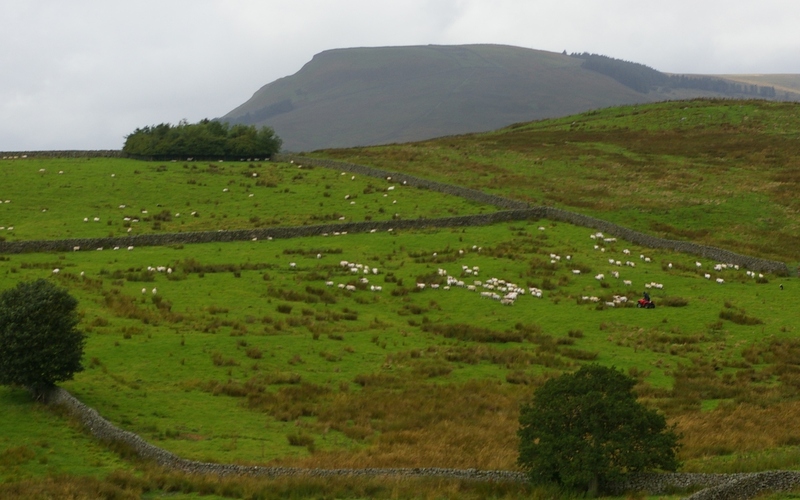 Yorkshire has a different palette of green to Kent, and hills that rise higher and steeper than the gentle Downs. Though we do have the White Cliffs and the Devil’s Punchbowl… but this is about Yorkshire! As we were walking around Kettlewell, a shepherd and his dog roared by on a quad bike, the collie braced to keep his balance behind his master, but clearly enjoying his high speed ride. The next day we saw them from a distance, out on the hill, hard at work rounding up this flock. The black and white collie is running along the dry stone wall, centre right of the picture, and once again giving every impression of enjoying himself. These black and white dogs were in every farmyard and on almost every street corner in the small towns in the Dale. We met another in York who appeared to be quite overwhelmed by all the different people going through the market place, as well as the many new smells; he did not know where to look or smell first and had that ‘mad collie’ look about his eyes that means his humans will have their work cut out keeping up with him. Perhaps he would have been happier out on the hill, rounding up sheep, but if he’d been let off the lead in town he would have been herding all the humans towards the Yorkshire Sausage Shop in The Shambles nearby. Wild boar pie, Shep? Yes, please! This entry was posted in Uncategorized and tagged Collie, dog, dry stone wall, Kettlewell, sheep, Shepherd, Wensleydale, York, Yorkshire, Yorkshire Sausage Shop on August 19, 2014 by willturnstone. shoots aiming for the sky from a fallen willow. Higher and further into Wales: from Laugharne to the Brecon Beacons, to stop and stare and absorb the tranquillity at a friend’s place: marjoram with meadowsweet; the herb colonising the paths above the damp land, where meadowsweet shelters the pheasant family from kite and buzzard if not weasel or cat. Tranquillity has been carefully nurtured: planting a tree here, a day lily there, giving the Mermaid rose room to spread herself into the trees around. Here, sometimes, there are Hereford cows, though this day the fence and hedge were holding back a mixed flock of sheep – the valley sheep are fatter, and would be fatter still were they able to chew the cud on spinach, beans and garden flowers. Not maintaining this fence would cause offence and distress. Distress and offence had already been caused in February. Our friend’s Eastern boundary once had a hedge and ditch on the other side of the line. A good hedge provides a home for insects, birds and small mammals; its roots protect the soil on either side from being washed away. The old hedge had been grubbed up, the ditch levelled, in the name of efficiency, today’s acceptable euphemism for laziness and greed. Cropped to the edge with spring-sown maize, year upon year, when the late winter storms came nothing could hold the top layer of soil from being scoured, and a stream formed around the little willow, undermining it. This tree was part of the informal hedging our friend had planted below the field edge, six feet on her side of the fence. Now the willow lay across the bench that commands a view across lawns, trees, bushes and beds, bulbs in season, and always the birds. 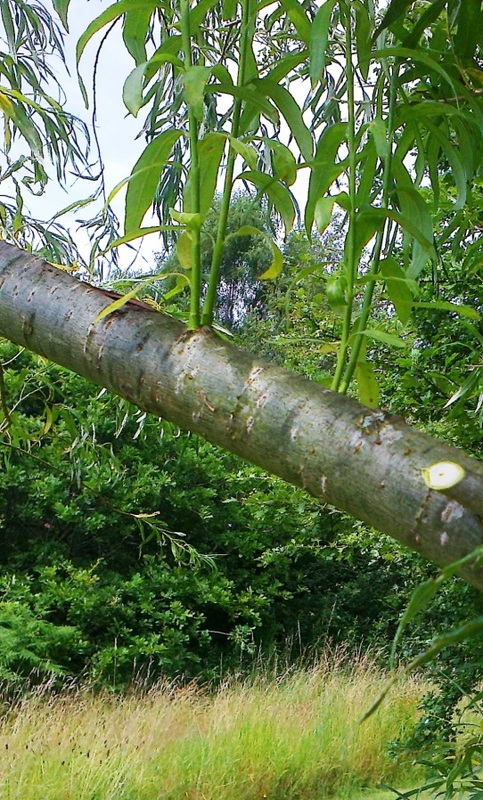 This tree had grown from an osier thrust into the ground and now had half a dozen stems, twelve feet tall and more. Only one was near vertical, the one that before the landslide had leant towards the field. I set myself to rescue the bench by cutting back each leaning trunk to a vigorous vertical shoot while leaving that one upright trunk to point the way. There were plenty of shoots to choose from, some of them six feet high already. Unchecked, the weight of this vegetation would have brought the willow right down onto the bench and maybe have broken it. I would have enjoyed having Dermot with me, with his love of trees and quirky insights, but had to commune with myself and Whoever might be listening. And I had to listen to the tree: where do you want to grow? How can I get you back to a pleasing shape? And my apologies for tearing a strip off your bark, misjudging that first cut across the front of the stem. Squirrels had barked the tree before me: did they use it as a painkiller? A few days later, Dermot didn’t think so; he says they’ll go for any bark, just to be destructive. Dermot doesn’t like squirrels. I wonder: the next time we come, perhaps they will be six feet and we will know they have taken. This entry was posted in Uncategorized and tagged Brecon Beacons, fences, gardening, Hereford cows, meadowsweet, Mermaid rose, Robert Frost, sheep, Thomas Love Peacock, tree surgery, W.H. Davies, willow on July 23, 2014 by willturnstone.